What is the child flight ? We will enjoy having you children to fly. 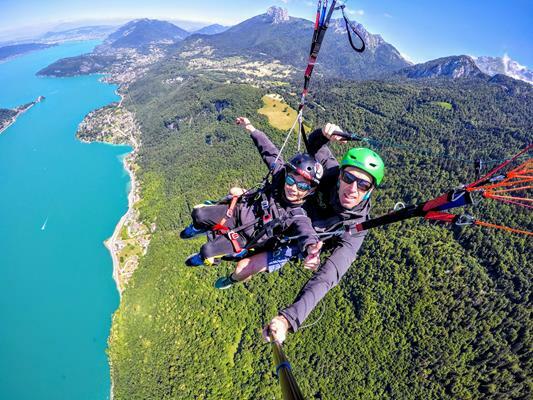 A nice and gentle pure glide over the Lake Annecy, safely down to the landing field in Doussard. This flight is done in the morning in quiet conditions from 10 to 12. Flight duration : around 15 minutes. Only one rule, no minimum age your kid has to ask for it!! We usually advise from 5 or 6 years old, but possible before. You will be told to come a couple minutes before we leave to our chalet at col de la Forclaz (town of Montmin 74210) above Lake Annecy. We’ll drive you to the take off thanks to our shuttle. After walking two minutes, you’ll reach the green carpet that’s on the take off. Check our photo and video galerie to see how it is. It is important to notice that contrary to parachute, we are not jumping of anything; a paraglider works more like a plane that we’ll take off with you on a gentle slope. You won’t have that feeling of standing on a cliff and have to jump of a step down. A briefing will be done by the pilot to tell you what you’ll have to do. That can change depending on the wind conditions. No worries, there is nothing difficult. After having you connected to the paraglider in front on him, the instructor will ask you to walk forward, you will feel a resistance in your back, it is the wing that starts to inflate. A couple of seconds later, you feel yourself becoming lighter. He will then ask you to run on a couple more meters sot ha we have a bit more speed and you’ll be gently lifted off the ground. You’ll never have the feeling of jumping or falling down. The take off is a great feeling of lightness. Then just have to enjoy the rest of the flight ! Count on about 1h30 until we have it all finished and you leave from the chalet. About 20 photos (still shots) and 4 videos given on a 4 GB SD card.